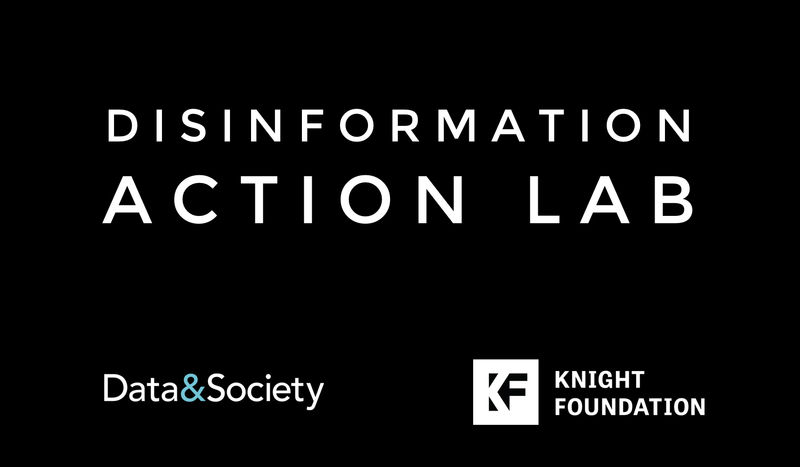 Data & Society is pleased to announce generous new support from the John S. and James L. Knight Foundation to launch the Disinformation Action Lab (DAL), a project to study and analyze propaganda and disinformation threats and develop solutions to address them. The lab will use research to explore issues such as: how fake news narratives propagate; how to detect coordinated social media campaigns; and how to limit adversaries who are deliberately spreading misinformation. To understand where online manipulation is headed, it will analyze the technology and tactics being used by players at the international and domestic level. This project builds off the ongoing work of the Media Manipulation initiative at Data & Society, which examines how groups use social media and the participatory culture of the internet to spread and amplify misinformation and disinformation. Recent releases from this initiative include Lexicon of Lies and Media Manipulation and Disinformation Online. The funding is part of today’s announcement that the John S. and James L. Knight Foundation is giving $4.5 million in new funding to eight leading organizations working to create more informed and engaged communities through innovative use of technology. The other organizations receiving support include: Code2040, Code for Science & Society, Columbia Journalism School, DocumentCloud, Emblematic Group, HistoryPin and mRelief. To receive future updates about this project, sign up for the Media Manipulation mailing list here.